Self-organizing, taking care of business, for the purpose of furthering a specific interest. Technically a syndicate is a group… but the heck with all that technical book learnin’! They can tell it to my tailpipes as I throw it into 5th, roll on the throttle, and move right on past in the fast lane. Built to adhere to principles above, the Joe Rocket Syndicate Jacket is constructed of 1.2mm leather and high tenacity nylon that has been tailored through a full flex system for a precise fitment and drastically improved mobility. CE-approved armor at the shoulders and elbows is in place to protect you in case of a fall, while a removable spine pad can be replaced with a CE protector if you choose to upgrade. 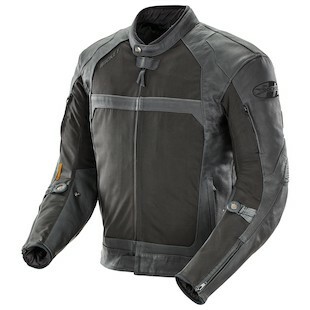 Additional features include a variable flow ventilation system that gives you more control over the amount of air coming into the jacket, a 4-point SureFit custom adjustment system, and a YKK outer zipper. So who needs a whole crew? Not you! Go with Joe Rocket and become a syndicate of one!